Does anyone else’s husband bring home spotted bananas from work? Well there’s never a shortage of bananas at my husband’s job. And no, he’s not a monkey tamer at the zoo – though, I’m sure at times it can feel like that. He coaches young hockey players and the nutrient-rich and carb-loaded fruit is a healthy snack that they keep stocked for them. But there’s always a few that go uneaten, earning them their spots. And those speckled beauties are delivered to my kitchen with the request that I transform them into some sort of baked good. I’ve sent numerous treats in for the team, so they know I like to bake. But loaf after loaf of banana bread was getting old, so I switched it up to muffins. And while muffins had a good run, it was time for something new. The banana adds just the right amount of flavor and sweetness, and keeps the cookies moist. Chewy oats, along with the coconut, give them so much texture. And chocolate chips, well, because chocolate. While these cookies are amazing as is, nuts can be added for some crunch. You can also swap out the chocolate chips for peanut butter ones. And if you don’t like coconut, skip it and add in 1/2 cup more of oatmeal, and stick with just vanilla extract. 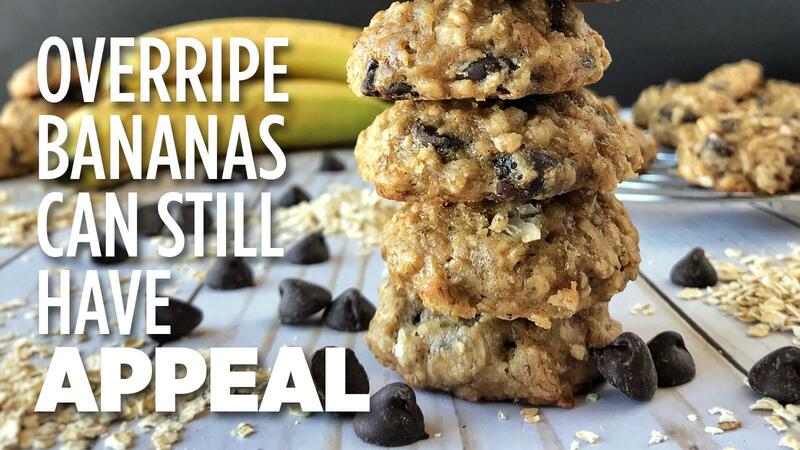 Out of all my banana goodies I’ve made, these cookies have been the team – and my husband’s – favorite. And, hopefully yours. In a large bowl, or bowl of a stand mixer fitted with the paddle attachment, add the mashed bananas, egg, sugars, butter and extracts. Beat until well blended (mixture will be runny). In another bowl, combine the flour, cinnamon, baking soda and salt. Stir into the banana mixture, while scraping down sides of the bowl, until just combined, (do not over mix or cookies will be dense). Fold in the oats, coconut and chocolate chips until thoroughly mixed. With a cookie scoop, or spoon, form the cookies into balls and place on baking sheet or tray, cover with plastic wrap and refrigerate for at least 2 hours, or up to three days. The dough must be chilled or cookies will spread. To bake, preheat oven to 350 degrees F and line a baking sheet with a silicone mat or coat with nonstick cooking spray. Place cookies on baking sheet, at least 2 inches apart, and bake for 14 minutes, or until golden around the edges but still soft in the center (they’ll firm up as they cool). Remove from oven and allow the cookies to cool on the baking sheet for about 10 minutes before transferring them to a rack to cool completely. Published: April 1, 2019, 5 p.m.